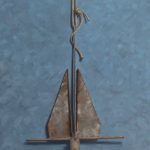 This is the story of how I turned a silly old life jacket into one of my best selling works of art so far. It’s funny how sometimes a really good idea can be starring your in the face; sometimes for years even. It just goes to show you how you should never discount the subjects in your daily life and you never know when an opportunity will present itself. You just have to keep moving forward and keep your head up, ready for opportunities. I can remember going out in a small blue row boat with my father. I was not even 10 years old yet. We would dig clams with an old rusty clam rake. Neither of us liked to eat clams, but my mother sure did and still does! So we dug. 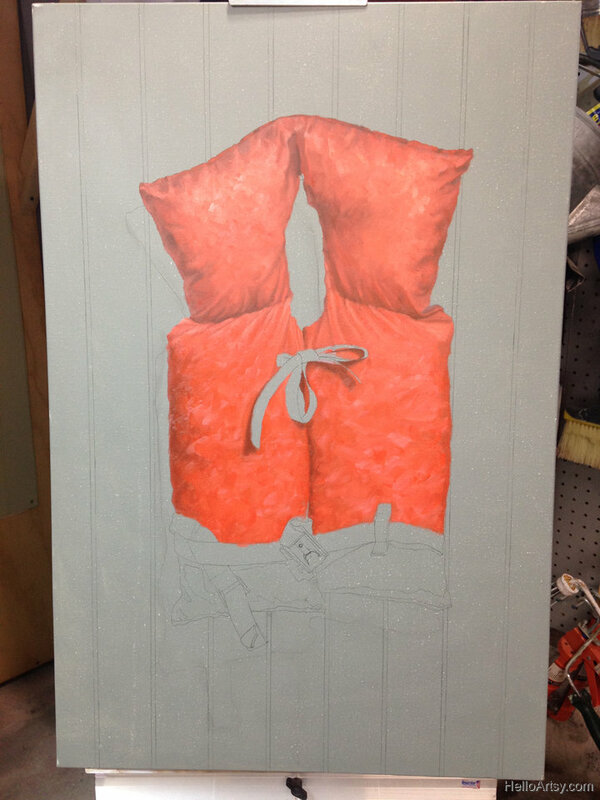 The first thing my father did before we went out onto the water was to cinch me up in this bulky, orange life jacket. I hated it. It seemed old, even then and besides it wasn’t very comfortable. He used to say things like “hold still damn it” as he tightened the straps around my little body. I put up with it because he was in charge and I really wanted to get out on the water. Whether, clamming, fishing, or the occasional water skiing venture, I always looked forward to getting out on the water and this life jacket was my ticket to those adventures. 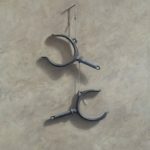 So there it stood, for years hanging in my parent’s garage. This life jacket, still bulky, still orange, although somewhat faded hung from a nail next to my parent’s compact car parked in their single car garage. For decades this life jacket was in plain sight for me to see. I must have encountered it hundreds of times. 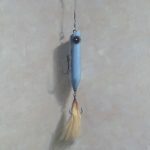 I’m not sure why, but at some point it struck me as an item to paint. I had been having much success with my marine-themed paintings so I thought I would give this a try. I cleaned it off a bit, with a hose. I had way too much dust clinging to the top of its surface. After it dried I cleared out my still life staging area and hung this old beauty from a large nail. I guess I should mention how I first placed some paneling against the wall of the staging area. It was actually the same paneling I used for my saddle bag painting. The color worked perfectly! 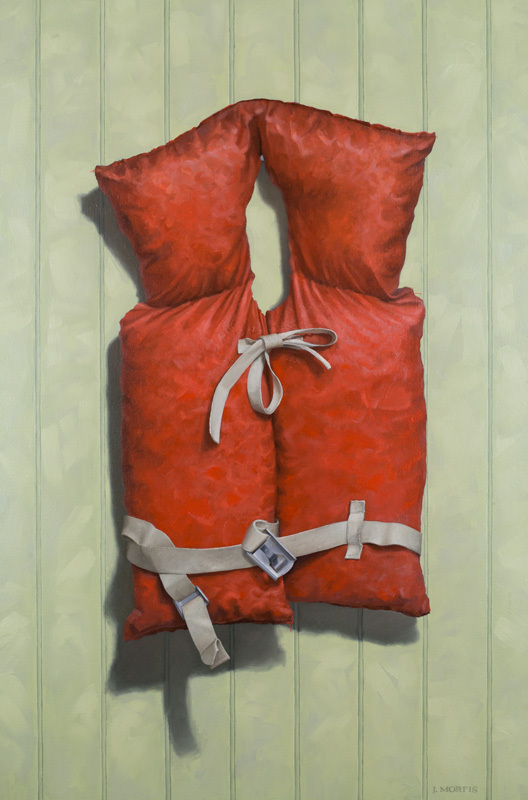 The rustic orange color of the life jacket was striking against the off-green paneling. I spent more time then one would imaging playing with various compositions. 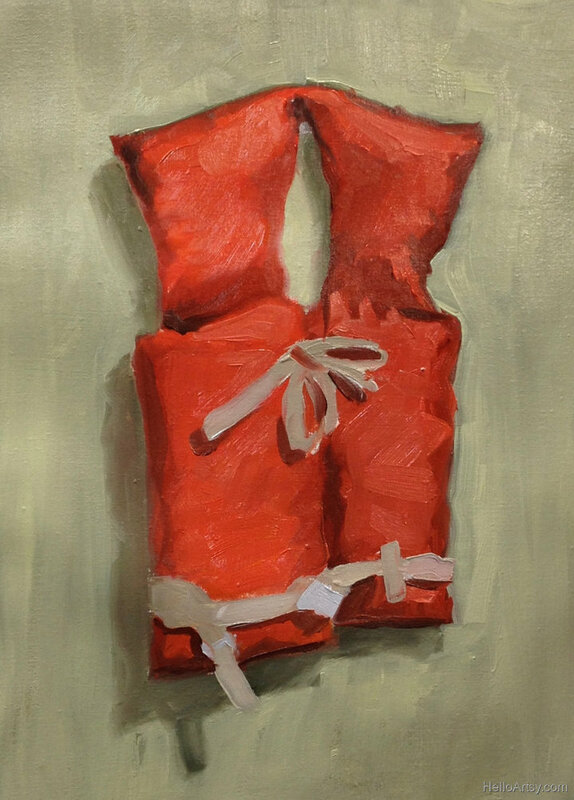 I mean, how many compositions can you get out of a simple old life jacket? I played with lighting and more than anything I spent a couple of hours manipulating the buckle and strap. I wanted it to look natural, but beautiful. I also needed the strap to stay put, because a painting this large would take weeks to undertake. With everything in place I did a poster study of the setup. This was just a small non-detailed painting that allowed me to calculate the colors I would need and to see a visual manifestation of my ideas. 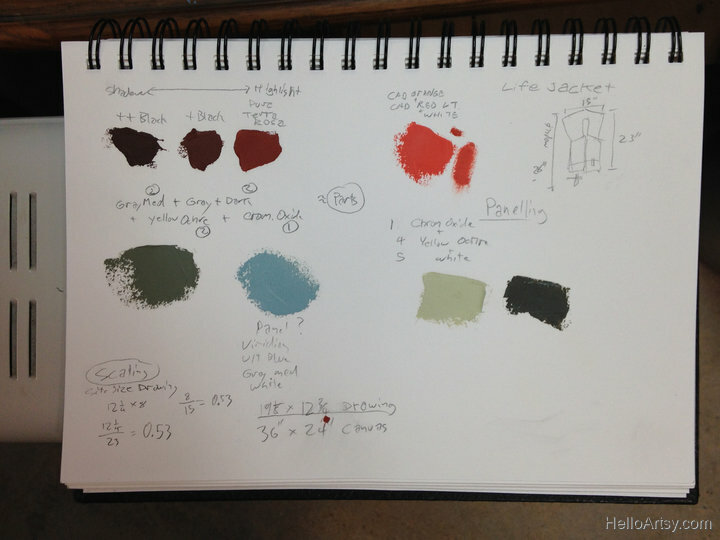 I also recorded some of the color recipes in my notebook as well. 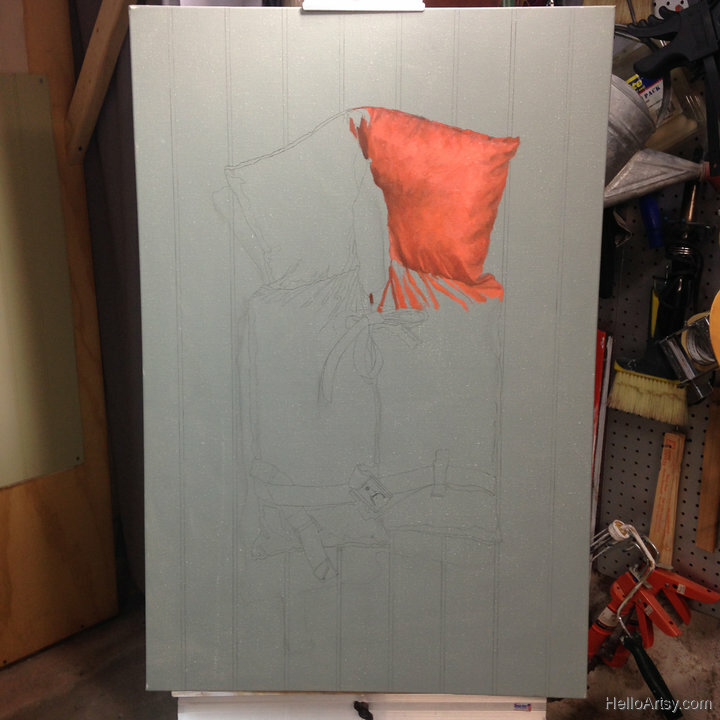 I tend to do this on my larger works and have found it handy should I need to remix specific colors to revisit troubled or unfinished areas of a painting. Here’s a page from my sketchbook, which is really one-part sketchbook and one-part notebook to be completely honest! 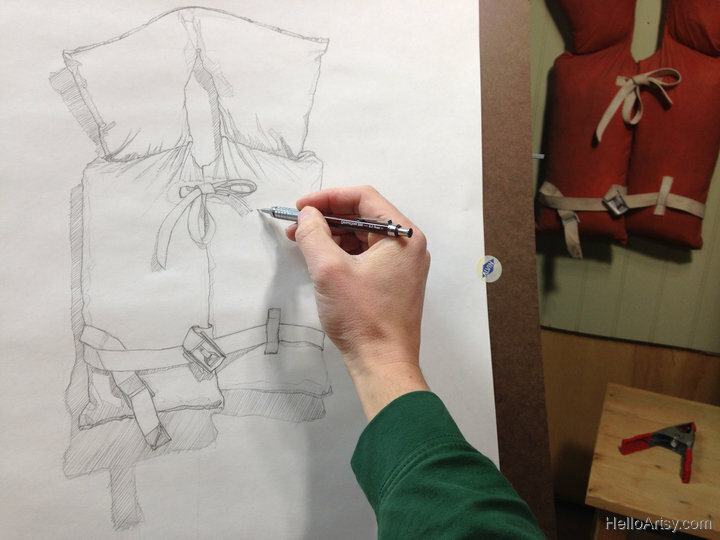 Next I worked up a precise drawing of the life jacket. I sight-sized this drawing so it was smaller than the actual painting was to be. Being primarily a line drawing I was interested in delineating the forms and color separations. Everything was meticulously measured out. I worked very hard at getting the proportions correct. In the drawing I made sure to separate the areas of light from shadow. This is always an exercise in decisiveness that proves it’s worth time and time again. It’s not always easy to decide where form-shadow begins and form-light ends, especially on areas of rounded forms. But, forcing this construct on my own artwork not only helps me establish a plan, but a powerful composition as well. Now that I’d decided how to separate my lights and darks (the terminator edge) the painting would be play out all-the-more-smoothly! I finally transferred my drawing to a stretched canvas and began painting. Because I had done so much preparatory work I approached this painting in more of a “complete one section at a time” fashion. I would never paint this way if I was feeling my way through the subject matter. The fact that I had done drawings, I had worked out my composition and even most of my colors ahead of time allowed me to work this way. 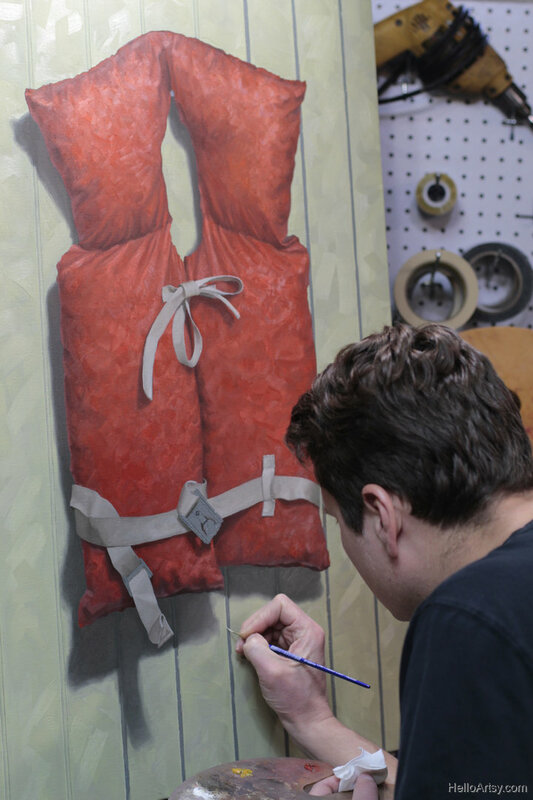 Here’s a few photos of the life jacket painting in progress. You’ll notice that as I’m painting along I’m including details with confidence. As I moved very slowly from one area to the next the previous areas looked almost complete! I never used to work this way as it assumed too much confidence and devotion to an un-proven area of paint. But, I must stress I was confident after I spent days planning and working out all of the problems ahead of time. Painting then just becomes a routine of following your own plan! I have found that most people lack the patience to work out everything ahead of time. Everyone wants to jump right into the painting. I have those urges too, but I have never regretted putting in the planning (drawings, color studies, etc.) ahead of time. I can’t say the same about hastily jumping into the actual painting process! The painting naturally required some touch-ups and the background paneling always takes way too many hours to complete, but it’s all worth it in the end. 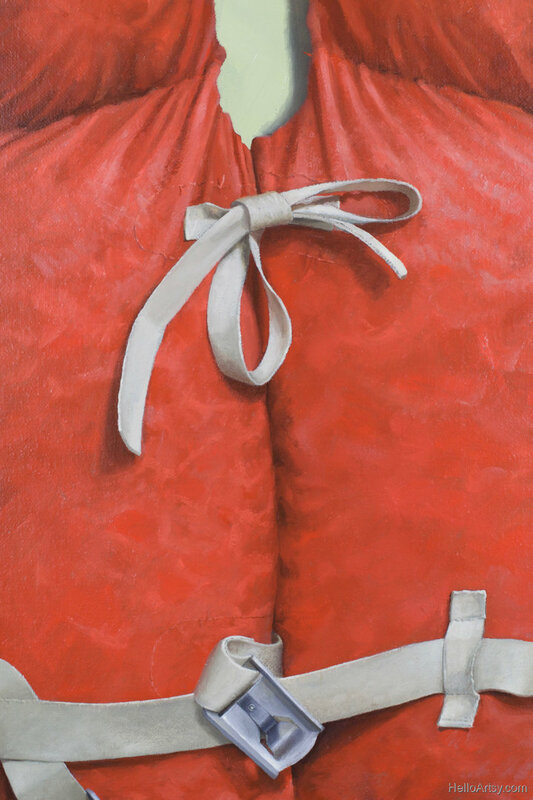 An if you’ve been reading thus far I think you deserve a closeup of the painting… enjoy! Hello John , Your story does inspire me . I am 15 and i love art well i started a month ago and been doing it regularly. 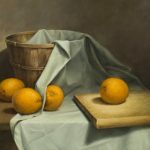 I usually do manga drawings and did some still life drawings past week.I know this is abit off topic with respect to the blog but couldn`t find more appropriate place. I am glad i found this site as itnreally offers straight to the point content. I have some questions regarding realism. Whenever i draw something from real life it mostly looks 2d. I tried using many shading techniques but still it just doesn`t add up. Whenever i start up a drawing regarding realism its just to hard intepret what kind of shape it is constituting. It is easier to do it manga drying as they consist of mainly eaiser. Thank you in advance and you really a great teacher and many of your tutorials really helped me. If you want me to upload some of my starting artworks compared to new ones i just made ( 1 month progress) I wouldn`t mind xP. If you want to get better at realism, take a break from drawing manga and focus on drawing from real life, direct observation! There tons of graphite drawing tips here on the blog. Just look around. I go really into great depth too. Also Raghav, make sure you are on my mailing list, because I occasionally offer mentorships in which I can give you one on one drawing help. Yep i subscribed to your newsletter and I looked up those tips and they really helped. Now i am only drawing from real life (still life) drawing things which are just laying around. But the problem is I cannot shade ( I mean i can just copy the shade from this picture but if it comes to shading on my own it troubles me as i don`t know where eaxctly the highlight would come which portion would be darker). And one problem is also that i can`t percieve things in simple shape any tips on that? Darn it. If i had the money i would surely buy the course i’ma start saving money from today onwards and surely will buy this course. And ye from now on i start using strong light source thanks for the tip.